Schalke striker Breel Embolo has refused to rule out the rumours suggesting he received a phone call from Jose Mourinho, urging him to join Manchester United. The Switzerland international was chased by a host of Europe’s elite clubs in the summer after his impressive performances at boyhood club Basel. The 19-year-old striker, who can also operate on the right wing, netted 31 goals along with 22 assists during his time with the Swiss Super League champions. Schalke sporting director Christian Heidel confirmed then that Manchester United were keen to sign Embolo, with Jose Mourinho trying to persuade him to join the red Devils. 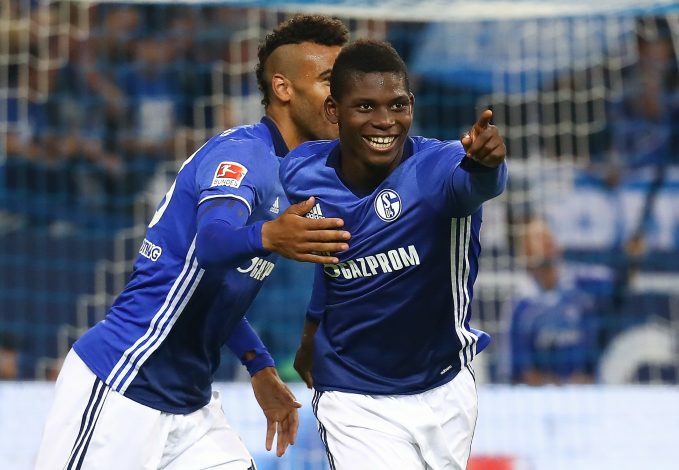 But Embolo, who has scored three times for Schalke in his 10 appearances so far, has refused to confirm or deny if United made a move for him. “I don’t talk about other clubs. I’m glad I’m with Schalke. I decided on Schalke, that’s all that matters for me,” Embolo told German outlet Blick. Embolo will be out of action for the rest of Schalke’s season after picking up a serious ankle injury against Augsburg in October. The young lad reportedly received an offer from high-flying RB Leipzig as well last summer, and he must now be wondering how things could’ve been had he had joined them, considering how the Bundesliga’s surprise package are a huge 18 points ahead of Schalke in the table.